I once spent three months in Argentina in the spring of 2012. Two of those months were in the chaotic, yet beautiful metropolis of Buenos Aries and the rest of the time meandering through small towns of Patagonia in the Andes. I’ve done my fair share of traveling, but Argentina was probably the height of my adventures. It’s a place you desperately love and hate at the same time. You cannot wait to leave and painfully miss it when you finally do. It is also possible to teach English in Argentina. Not surprisingly, most teaching jobs can be found in Buenos Aires. If you are looking to save money teaching English, then Argentina is not the place. If you are looking to fall in love with life, experience something different and find yourself as an individual, Argentina makes sense. Despite crippling inflation in recent years, Argentina remains one of the larger economies in Latin America. A large portion of the population in Buenos Aires are well-educated, traveled and in need of some level of English proficiency. Unlike China and other parts of Asia, you are not going to find many, if any advertisements to teach there. It’s just one of those places you have to travel to, do a bit of networking, manage not to throw away all of your savings and find work as a freelancer. Of course, nobody goes to Argentina to work and save money, but rather to live. It is a great place for intellectual stimulation, art, outdoor activities or just finding yourself in life. Personally, I will never forget my time there. While I never taught English in Argentina, I was there long enough to meet a few teachers that did, be offered a few jobs and get an overall feel for the working conditions as an English teacher there. How much money can I expect to make if I teach English in Argentina? What is the cost of living? What qualifications do I need to teach English in Argentina? Do I need a work visa to teach in Argentina? Don’t expect to make much even in the capital of Buenos Aires and be satisfied if you can earn enough to live on. Most teachers in Argentina make between $600 to $1200 per month. Those in Buenos Aires make $1000 to $1200 if they hustle and work full-time. Most teachers are employed by private English language institutes in Buenos Aires. Wall Street English is one of the larger companies that operates in Argentina, but I wouldn’t recommend this school or company. It is certainly possible to make extra money through private lessons, but students can be flaky and do not expect to make more than $15 per each one-hour lesson. Argentina is less expensive than Western Europe, New York or California, but it is far from inexpensive. Except to pay what you would in a smaller North American city. Some items in the grocery store can be surprisingly expensive, but alcohol, hostels and hotels are reasonably priced. A one-bedroom apartment in a nice part of Buenos Aires costs $800 to $1200 per month, but it is common to rent out a room for $400 or $500. 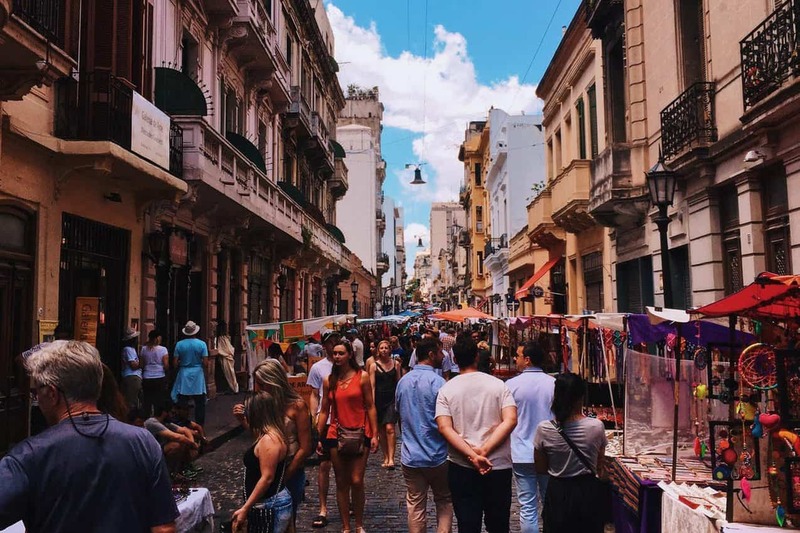 If you make Argentinean friends, you will learn where the best deals are and how to make your meager income go a long way. If you are planning on staying in Argentina for a year or two, I advise having at least $5000 to$8000 in savings to fall back on. Again, people teach in Argentina for the experience, lifestyle and culture. The job market for teaching English in Argentina can be competitive since there are a limited amount of positions. People usually first come to travel, fall in love with the place and teach English as a means to stay and survive. It isn’t necessary, but it is advisable to get a TEFL, TESOL or CELTA before coming to Argentina. Any of these will qualify you to teach abroad and having a certificate will give you a leg up on the competition, much of which does not have a certificate. Argentines also appreciate those that are strong-willed, witty and intellectual, so make yourself interesting when applying to a school. The majority of teachers in Argentina are working on a tourist visa, which the government generally turns a blind eye to. There are schools that sponsor visas, but it isn’t the norm. Many teachers in Buenos Aires make a visa run every three months to Uruguay, which is a great country to visit. Again, if you are serious about spending time and teaching in Argentina, you will need some additional funds for miscellaneous expenses. I would love to teach in Argentina . I have completed TEFL. I also attended CELTA . At present working as an English language teacher in India. I wish to travel and teach in Argentina kindly provide me the proper place there to teach. start my own blog in the near future. Anyhow, should you have any recommendations or tips for new blog owners please share.